The Army National Guard of the United States consists of the "land force" of the United States National Guard, or organized militia, of the several States and Territories, Puerto Rico, Guam, and the District of Columbia, active and inactive, as defined in Title 32, USC Section 101. The Army National Guard is a reserve component of the United States Army. Maintained by the National Guard Bureau, units are under command of the state's governor. An exception to this rule is the D.C Army National Guard; the D.C Army National Guard is under the direction of the President of the United States. When the unit is federalized, the unit falls under the command of the President of the United States. Like the United States Army Reserve, many members usually serve "One weekend a month, two weeks a year", although many members also serve full-time in order to maintain units, and many units have become more active in military operations in recent years. The Army National Guard is the oldest branch of the U.S. military, tracing its origins back into American colonies as far back as 1636. English colonists needed to protect themselves and drew civilians into organized militias, from which are descended some units of the Massachusetts Army National Guard. The Army National Guard officially received its title in 1798. 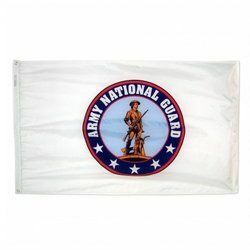 AmericanFlags.com proudly features Army National Guard Flags.